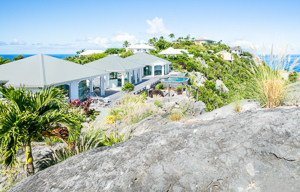 Villa UJV 116, also known as byzance, is a very private and unique villa with wonderful views of Colombier, St Barts, in the front, and distant views of Saba in the back. This villa is very contemporary and decorated primarily with light and dark gray fabrics. Large arched windows allow the natural light to stream into the living spaces creating a serene environment. The two air-conditioned bedrooms are on either side of the kitchen and living area, offering maximum privacy. Each bedroom has a platform king bed, ensuite bathroom, and overlook the views. The master bedroom has light and dark gray curtains and an ensuite bathroom with sauna. Steps lead down to a sunken sitting area, which also serves as the main living area. Not an ideal villa for young children.